Chicago Mailing Tube manufactures a 3" x 12" self-locking kraft tube perfect for big and small business needs. Whether mailing a large amount of wholesale products or simply mailing single products at a time, look no further than Chicago Mailing Tube! Our mailing tubes come in a variety of sizes and are ideal for preserving paper, plastic, posters, blueprints, textiles, and more during shipping. 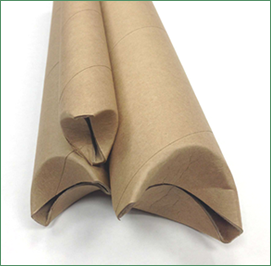 Chicago Mailing Tube provides a durable, affordable, and high-quality 3.000" x 12" cardboard kraft mailing tube perfect for your industrial, business, or personal shipping needs. With self-locking, crimped-ended kraft tubes fitted with plastic plugs and end caps, there's no need to worry about your shipment arriving safely. Additionally, Chicago Mailing Tube's products come in a wide range of sizes and are all carefully quality tested to make sure that you receive the best mailing tube. Whether you're shipping a single item or a high volume wholesale order, our tooling experts will help you find the right product you need. With a comprehensive selection of sizes available, you can ship posters, textiles, blueprints, paper, and more through UPS, FedEx, and USPS. Call us today at (312) 243-6050 for a quote on 3.000" x 12" self-locking, crimped-ended cardboard kraft tubes. No minimum order required and we offer 24-hour shipping! Fill out the contact form for more information. These heavy-duty kraft tubes with plastic plugs are perfect when sturdiness is required. They are perfect for shipping with UPS, FedEx and USPS. Uses include shipping, hardware, drapery rods, antennas, track lighting kits, metal rods and more. End caps fit snuggly to protect the contents.